Witnesses say the car entered the building at a relatively slow speed and kept rolling through a physical therapy office located inside the fitness center. A manager at the gym was in her office next to where the car had entered the building and could not believe what she was seeing. Paramedics responded to the scene of the accident, as did the police. First responders determined that the driver was not seriously injured but was understandably shaken up as a result of what happened. The male passenger meanwhile decided the best thing for him to do was go into the gym for his workout, since that was the reason they came to the fitness center that day. After they determined the passenger was not injured, they said it was okay for him to go into the gym, as did gym management. Police have not said whether driver was issued a moving violation in connection with her allegedly crash into the Boston gym, but luckily neither she, her passenger, nor anyone else was seriously injured as a result of this somewhat strange Boston car accident. 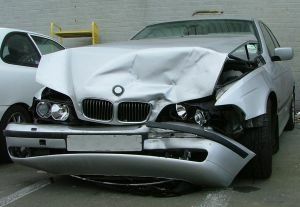 Car accidents involving a vehicle crashing into a business or even a home occur far more often that one might think. This is especially true when the at-fault driver is drunk or on drugs and might be driving in an extremely dangerous manner. These types of car accidents involving a structure are also much more common in the winter when roads are icy and cars are more likely to slide onto sidewalks and into buildings. In addition the obvious difference that a home or business might be damaged, there is also an increased likelihood that one or more people will be seriously injured in this type of accident. There is a decent chance there will be more than one personal injury victim, and this may be an issue when a car insurance policy has a per accident limit that is less than the total amount of damage caused. A car insurance liability policy has limits per personal injury, per accident, and for property damage caused to the personal property of others. The limit for each total injury is applied to a single injury to a single patient. However, the limit for the total liability for the entire accident is cap on the amount of coverage from every personal injury in the accident. You should speak with your Boston car accident lawyer about the best way to achieve the highest possible financial settlement or jury verdict following a serious accident.